Surprises in my opinion never really come often enough in life. Granted some surprises are bad, like a phone call from your bank that says something to the effect of "I'm sorry to report that we had a rogue clown break into our vault and he pilfered your non-FDIC-insured safety deposit box." But most of the time surprises are welcome times, such as a phone call out of the blue from an old friend or a letter in the mail that informs you that you are the long lost heir of the late (filthy rich) Duke of _______shire in ______land. My favorite surprise of late was a coffeehouse called Urban Grind that I randomly came across upon a leisurely walk on my way back to my hotel in Atlanta. I had passed the place several times actually on other excursions but had dismissed it as mediocre as I had not heard of it prior in my research nor did it seem promising sitting on the corner of an out-of-the-way road near a small housing development. What finally drew me in, I do not know; I think it was simply that I like giving the unknown a whirl (when it comes to food of course). The exterior was a pretty basic stone structure combined with a what-looked-like a pre-fab building; basically a clean look with roped-on banners. The interior was much more eclectic, with some really stylish vintage furniture of all sorts all surrounding a central counter. The surprise of it all was that this seemingly random coffeehouse served Intelligentsia. Usually, when a place serves such a well-known coffee it finds its way on the radar but somehow UG managed to elude detection. While they do offer french press (second surprise, as it's not a common offering), I ordered a cup of the Organic El Gallo drip which proved to uphold a superior taste characterized by a sweet buttery nuttiness (third surprise, as just because you serve a good coffee doesn't mean it will be a good coffee). The espresso sadly was pulled long and came out with not much crema and a bit short of the potential that Black Cat (the name of the Intelligentisa espresso blend) is known for. The tea I failed to notice. As I walked away, I definitely had more of a spring in my step and further confirmation that random stops at random shops sometimes do prove wonderfully fruitful. 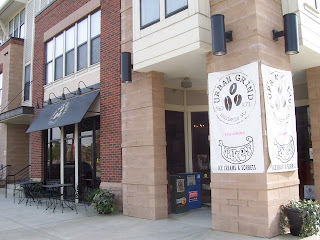 While Urban Grind still could use some improvement to get to the top of their game, they seem like they have a good start. If nearby, give UG a stop.